“I will have strong hands and a full heart.” [/caption]Most sigil requests we receive relate to a few key concepts, such as love, happiness, health and prosperity. Those are hugely important parts of human existence, and the lack of those elements in your life is also relatively easy to notice. Those subjects are also huge, and their borders and thresholds are as vague and shifting as the topography of clouds. Will a new romance bring your love, or simply distract you for a moment? Will a new job truly bring you prosperity, or simply reduce the fear of poverty? Does a thousand dollars bring wealth, or is the hard limit on that one a million bucks? 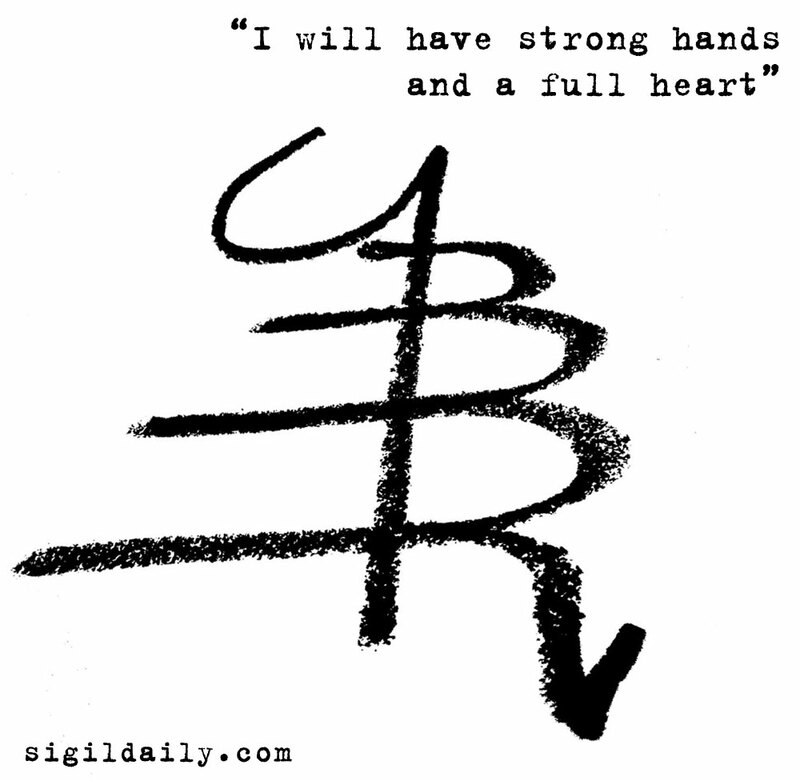 Today’s sigil is about getting just a touch more specific. It’s very ancient world in tone, implying the vitality and physical presence of strong hands, and the contented wellbeing of a full heart. It promises nothing other than a steady, healthy state of body and of mind. With that as a foundation to stand on, perhaps it will be easier to see more specific and empowering actions to take next. Like our last sigil, this symbol echoes West African traditions. Keen eyes will see suggestions of the Akoben’s call to courage and action, the Nkyinkyim and other symbolic influences from the Adinkra tradition.